Britain's Foreign Minister Boris Johnson leaves 10 Downing Street in London, June 13, 2018. If Davis’ resignation rattled May, Johnson’s shook the foundations of her government. 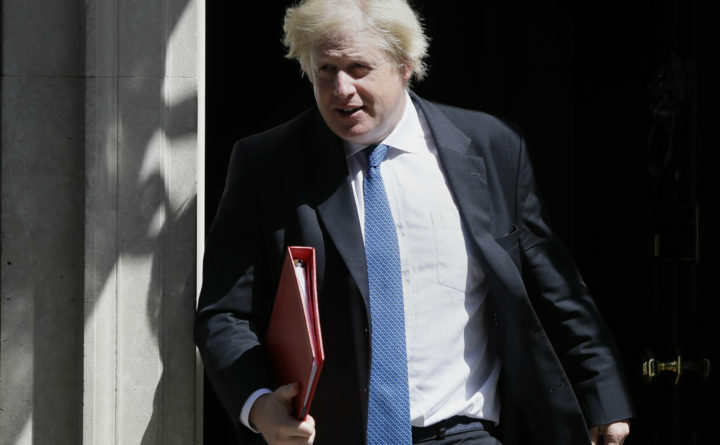 The tousle-haired blond Johnson is one of Britain’s best-known politicians, and one of the most prominent advocates for Brexit. Some euroskeptic lawmakers dream of replacing May with a staunch Brexiteer such as Johnson, a populist, polarizing figure who has never made a secret of his ambition to be prime minister. “It is as though we are sending our vanguard into battle with the white flags fluttering above them,” Johnson wrote in a letter that underscored his credentials as a champion of full-speed Brexit. May met with Conservative lawmakers in a packed room at Parliament in a bid to calm the feverish atmosphere in the deeply divided party. Under Conservative Party rules, a confidence vote in a leader can be triggered if 48 Conservative lawmakers write a letter requesting one. But leading pro-Brexit lawmaker Jacob Rees-Mogg said he didn’t think May would face a leadership challenge. “My concern is about the policy rather than the individual,” he said. Two years after Britain voted 52 percent to 48 percent to leave the European Union, May is trying to find a middle way between two starkly differing views —within her party and the country — of the U.K.’s relationship with Europe. Pro-Europeans want to retain close economic ties with the bloc and its market of 500 million people, while some, but not all, Brexit supporters want a clean break to make it possible to strike new trade deals around the world. Government unity began to fray within hours. Brexit-supporting lawmakers were angered by the proposals, saying they would keep Britain tethered to the bloc and unable to change its rules to strike new trade deals around the world. They also argued that the proposals breach several of the “red lines” the government had set out, including a commitment to leave the EU’s tariff-free customs union. Johnson said in his letter that May’s plan to keep close economic ties with the bloc means Britain is heading for a “semi Brexit” that would leave Britain with the “status of a colony” of the EU. She said she and the two departed ministers “do not agree about the best way of delivering our shared commitment to honoring the result of the referendum” in which U.K. voters opted to leave the EU. May said the plan would deliver frictionless trade with Europe and was the “only way to avoid a hard border” between the U.K.’s Northern Ireland and EU member Ireland. Working out how to keep the currently invisible border free of tariffs and customs checks has been a major stumbling block in negotiations. Rebuffing claims that her proposals make too many concessions to the EU, May said her “smooth and orderly Brexit” would leave Britain free to make its own laws and trade deals. “How can anyone have faith in the prime minister getting a good deal with 27 European Union governments when she can’t even broker a deal within her own Cabinet?” he asked. But May’s allies fear more resignations may follow. Steve Baker, a junior Brexit minister, resigned along with Davis. May appointed staunchly pro-Brexit lawmaker Dominic Raab as the country’s new Brexit secretary.Many pro-Brexit lawmakers were furious at what they saw as a sell-out of the clean Brexit they desire. Euroskeptic Conservative lawmaker Peter Bone said party activists felt “betrayed” by the government plan.